mundane jane: Some things require absolute perfection. Some, not so much. Some things require absolute perfection. Some, not so much. I don't believe in writer's block. I do believe in having other things I'd rather be doing. Some days I believe in being too tired or just too bored to write anything down. But anyone who tells you that he or she isn't writing because they can't? Bah. Writing is easy. It's the stuff you have to do to the writing next--that's the hard part. I spend the majority of my days, these days, trying to convince the young folks that it's all in the revision. They just want to sit down at the computer, type it all out, and be on their way--maybe go to a kegger and listen to that loud rock and roll music. That's not their fault; lots of people think it works that way. Even the worst of these blog posts have been through a lot of revision. In publishing, revision is king. Everybody has a go at it--usually more than once. But the deadline looms, and eventually, you have to put down the blue pencil and send the writing (and photography and layout) on its way. Somebody has to say, "it's good enough." No one ever says, "It's perfect," because it never is. But that's exactly where I've been on those days you weren't able to find me. I was trying to get it perfect. And I'm sorry to have to report to you now that just isn't going to happen. I'm going to assume that you're okay with that. You've had 434 opportunities to let me know otherwise. Unless I hear from you, I'll just keep doing what I've been doing. Whether I think it's perfect enough, or not. Image, Library of Congress Collection of Lithographs by Calvert Litho. 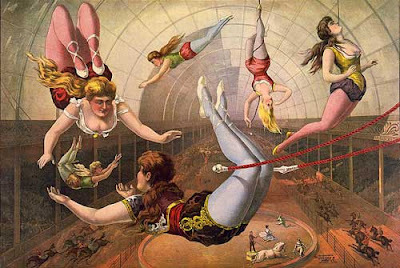 Co., Trapeze Artists, 1890.